Speak-on connectors are screw on connectors that makes connections to your professional audio equipments much faster and extremely easy. It is generally used to connect loudspeakers to amplifiers. 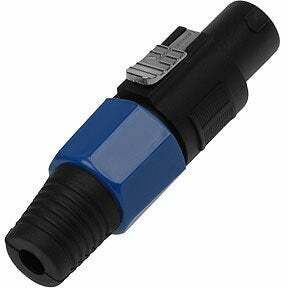 The shield provided over the connector saves from electric shocks sourcing from high-powered amplifiers. The airtight receptacles prevent air leak from speaker enclosures. Also, the connected cables are prevented from short circuits and hence are recommended for equipments in operation. SFCable provides you quality products at most competitive prices by sourcing the products directly from manufacturers. Satisfied customers are the ultimate mantra of our store. We also provide lifetime technical support on our products.